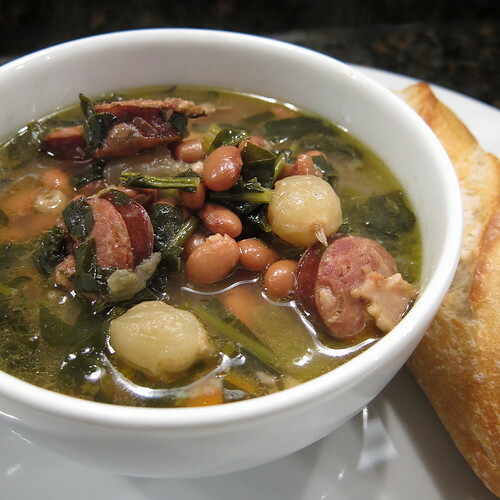 We are all about the comfort foods right now and this soup came about because of a craving for cassoulet. Now, this is by no means a cassoulet, but it's a kissing cousin with its slow cooked beans and sausage. You could not get much easier than this dinner. It's pretty much a throw everything in the crock pot and let it simmer all day sort of thing, I didn't even bother crisping the bacon before cooking. It smells amazing and is full of wonderful slow cooked flavor. A few notes on this dish: You could easily skip the kale, but we are always looking for ways to get a dark leafy green in the winter. The only thing I might do differently next time is add the sausage the same time as the kale. It got a pretty soft texture from the long cooking. The soup gets a lot of its flavor from the sausage, but that last hour should be enough time for that to happen. Rinse the beans. Put everything except the kale in the crock pot. Set to high and let cook for about 4 hours. Taste and season with salt and pepper. Add the kale. Let cook about another hour until the beans are nice and tender. Serve with a good crusty bread. You know, I've never ordered beans from Rancho Gordo. The sheer plethora of available legumes makes my head spin. But your soup looks so delicious. A great way to use up the collard greens in my freezer. Definitely reminiscent of cassoulet. Sounds fantastic for a cold winter day. I have to order some of those beans. They have such interesting varieties! My husband made this soup today, and it is hands down the best soup we've had in many, many years! We can't wait to share it with family and friends! Delicious! I don't have frozen pearl onions. I want to add some fresh red onion (I have lots from the CSA). Do you think I should cut in big chunks and add at the beginning? I'm a big fan of your soups. I'm making the winter veggie barley soup for dinner right now! I really want to make cassoulet this winter. But this soup looks great in its own right!